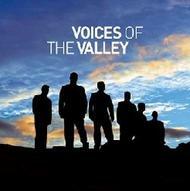 From the hills and valleys of Wales we bring you 'Voices of the Valley' - over 60 male voices raised in song and steeped in tradition. This album cuts through much of the present day wizardry of recording to bring you a raw and heartfelt sound. The swell of voices pack an emotional punch and take you on a journey of hymns, popular tunes and traditional Welsh songs, including You Raise Me Up, Jerusalem, Sailing, Delilah, Go West and Danny Boy.